Please read through the questions and answers below before making a purchase. Most commonly asked questions are listed here in order to help you understand how our templates and other items are designed and what you need to know in order to use them. What are the allowable uses for your products? Our card templates are designed to be purchased by professional photographers to enhance their offerings to clients and boost their sales. With the exception of some of the older templates they are fully layered allowing you to swap out the included backgrounds for your own or others that you purchase from TACtile Studio. All of our items come with a PHOTOGRAPHER'S USE LICENSE that allows professional photographers to use these items in their business - to design products for their clients - without needing to credit TACtile Studio. In addition to the above uses for professional photographer's we also grant LIMITED COMMERCIAL USE FOR PHOTOGRAPHERS which allows a professional photographer to use the digital papers and design elements in their marketing materials including printed items like business cards, letterhead and promotional pieces. If used in this manner you are required to include sourcing information if sharing photos or other images of these items across social networks and/or within the photography community including social media websites and private or public forums. A link to TACtile Studio will be accepted as proper sourcing and credit information. Included with the LIMITED COMMERCIAL USE FOR PHOTOGRAPHERS is the ability to use the digital papers as backgrounds on your website and/or blog. Again, if used in this manner you MUST credit TACtile Studio when sharing screenshots or other images of your website or blog across social networks and/or within the photography community including social media websites and private or public forums. A link to TACtile Studio will be accepted as proper sourcing and credit information. All of our items are available for personal / scrapbooking use including use for digital and/or printed scrapbook layouts as well as personal greeting cards, invitations, or announcements. If your scrapbook design is published - in print or online - you MUST credit TACtile Studio for the elements used. If you share images of your card creations in a public forum - including social media websites, public or private forums, or a personal blog or website, you MUST include sourcing information and provide a link back to TACtile Studio. All template layers MUST be flattened so that the digital elements purchased from TACtile Studio cannot be extracted in part or in whole by the end user. A successfully flattened design will contain the entire design layout on one layer allowing the user to easily slide their image(s) in behind the design. You CAN NOT purchase TACtile Studio's pre-designed card templates and re-sell them in an online shop such as Etsy, Ebay, Big Cartel, or on a personal domain. These templates are not meant to be purchased by someone offering "customized personal cards" for sale even if they are selling flattened digital files or offering the printing services themselves. Sharing. Each product is licensed only to the individual that made the original purchase. Claim. If you use TACtile Studio items give credit where credit is due; do not claim them as your own. Resale in an "as is" condition. You cannot purchase items from TACtile Studio only to turn around and list them for sale on your own website. Tangible goods. TACtile Studio's digital papers are not to be printed and sold as tangible items. This includes but is not limited to printed scrapbooking paper bundles, printed photography backdrops, and stationery items. Stationery items does not apply to photographers using the items to design cards or calendars or storyboards, etc. for their clients within their own business. It does apply to someone printing (for example) blank note cards with a pattern from TACtile Studio on the outside - then taking it to a local card shop and asking them to sell "their" cards with their name and logo on the package. In a case like that TACtile Studio would not be properly credited and that person would be laying claim to the design. Logos and service marks. Design elements from TACtile Studio are not licensed for use in logo design whether it be for yourself or others. What software do you design your templates in? What software can I use them with? All of our templates are designed using Photoshop CS2 or above. We cannot verify that these items are compatible with versions older than CS2 or alternate software. They have been tested and verified to work with Photoshop Elements. As of August, 2010 items are designed using Photoshop CS5. I've just started using Photoshop; are your templates difficult to use? We recommend having an intermediate level knowledge of Photoshop in order to successfully use our templates. You should understand layers, blend modes, and clipping paths. There are plenty of online resources with tutorials to help you understand these commands. Where can I print the card and album templates? Our custom die cut shapes are currently only available for printing at Full Color Lab. The die cuts can also be used with the Luxe line of cards available through Miller's or they can be printed as a standard square corner card. All of the flat and folded card templates can be used with any professional print lab. The album templates - both full size and minis - were designed around WHCC's design templates but again, these can easily be adjusted to fit within any lab's print guides. Do you include the fonts shown in your samples? Fonts are not included due to copyright laws so choose your favorite font from your own font library or browse online for a suitable one! One of our favorite FREE resources: www.dafont.com - you're sure to find something you love! Did you take the photos used in your samples? We wish we could lay claim to the beautiful images used in our samples, but we can't. They are the creative work of Ronda Bragg (unless otherwise noted in the product listing) who owns www.RondaBraggPhotography.com. She was super kind and has allowed us to use her art in our template samples. Once I make a purchase how will I receive my product(s)? Upon completion of the checkout process you will receive instant links to download your items. These links will remain active for 28 days or up to 5 downloads, whichever comes first. Should you need to re-download during that time frame please log into your account and view your purchase history to gain access to the download links. Beginning September 1, 2012, should your links expire before you have a chance to download your items you will need to pay a link reactivation fee of $10.00. This fee is charged PER ORDER. Please click here for more details and to begin the reactivation process. We use Paypal to process and accept credit card payments (VISA, MC, DISCOVER, AMEX) or, if you have a Paypal account, you can choose to use your Paypal balance or your checking account. You do not need to have an account with Paypal in order to complete the payment process. Please note that if payment is made with an e-check from your checking account via Paypal you will not receive your download link(s) for your product(s) until the payment clears. This is typically within 3-5 business days. I purchased a template/digital item and am not going to use it/don't know how to use it/don't like it. Can I get a refund? Once a product is purchased we cannot offer a refund due to the nature of the downloadable/emailed digital files sold. Please be sure you have the level of knowledge recommended and the software needed to successfully use our templates BEFORE making a purchase. There are NO exceptions to the NO REFUNDS rule. Can I purchase a Gift Certificate and send it to a friend/family member/business associate? Yes, you sure can! Our shopping cart makes it super simple to purchase gift certificates in any denomination! Simply add the gift certificate(s) to your cart and checkout as usual. Once your purchase has completed please send an email to: terry@TACtile-Studio.net letting me know that you've purchased a gift certificate. Please be sure to include your order number! I will then release your gift certificate(s) and they will be available within your account. You can then send them to anyone you choose by simply entering their email address in the area provided! Our pennant banners are printed on Premium Canvas - the same canvas that your professional print lab uses for your client's gallery wraps. Each pennant banner includes seven (7) flags and each flag has two holes punched - one in each top corner - and they are then finished with silver grommets. Pennant banners also come with twine for stringing and hanging but, you can also use your own ribbon or string. Shipping is included in price. All orders shipping to an address in the state of Ohio will be charged 8% sales tax. Standard Triangle: Each triangular flag measures approximately 6" across the top (left to right) and 8" from the top to the bottom tip. Double Pointed Rectangle: Each double pointed rectangular flag measures approximately 3" across the top (left to right) and 8" from the top to the bottom tip of the points. 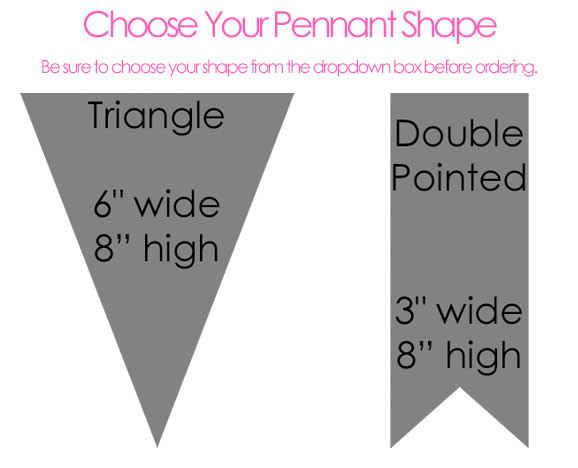 Both shapes are perfect for all types of parties, as home decor accents, or as photo shoot background accents. Premium Canvas pennant banners can be used indoors or out. All of our items are printed on demand. We do not stock any items and by doing so this allows us to keep our costs down. Because these items are printed as ordered we can not accept returns or offer refunds. Please be sure to verify the details of your order - sizes, colors, quantity, pennant shape, pattern, etc. before submitting your order to us. All orders for printed items are submitted to our labs for printing within 24 hours of order placement and therefore we do not have a window for order changes. In the event of a material defect or damage due to shipping please contact us within 7 days of receipt of your order so that we can address the issue. In most cases, if the defect or damage is due to a printing malfunction at our lab or was caused due to the shipping process, we will replace your item at no additional charge to you. Gift certificates are available in denominations from $5.00 to $50.00 or any combination to create the amount you need! Once you purchase a Gift Certificate, you will receive an email with a special redemption code to use at checkout. They do not expire and can be used on any item available at TACtile-Studio.net. Gift certificates are completely virtual and we do not mail out gift cards or paper certificates. If you need something tangible to insert into a card please email us and we can provide you with an image to print out. For detailed information regarding gift certificates please click here.